And so it begins, the great American Road Trip. This year’s US road trip will cover about a dozen states and countless incredible locations. I’ve always said that my favourite country to travel is the US, and it’s for good reason. There are just so many incredible sights here. There is also such great variety to the destinations in The States. 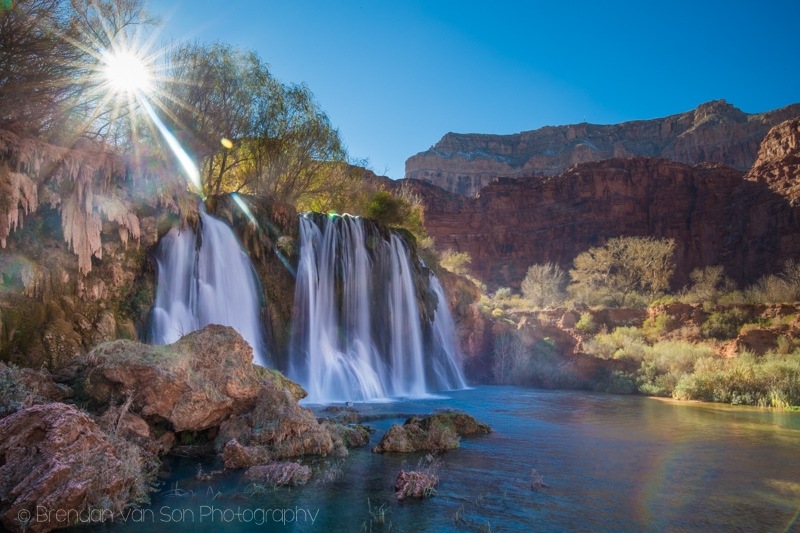 One of those amazing destinations is the first major stop on the road trip, Havasu Canyon and the highly acclaimed Havasu Falls which might be one of the most impressive waterfalls in the world. On this episode, I take you inside Havasu Canyon to see the incredible landscapes that lie within. Of course, below the video is information on things like how to get to Havasu Falls and where to stay once you get there as well as some images from the trip. 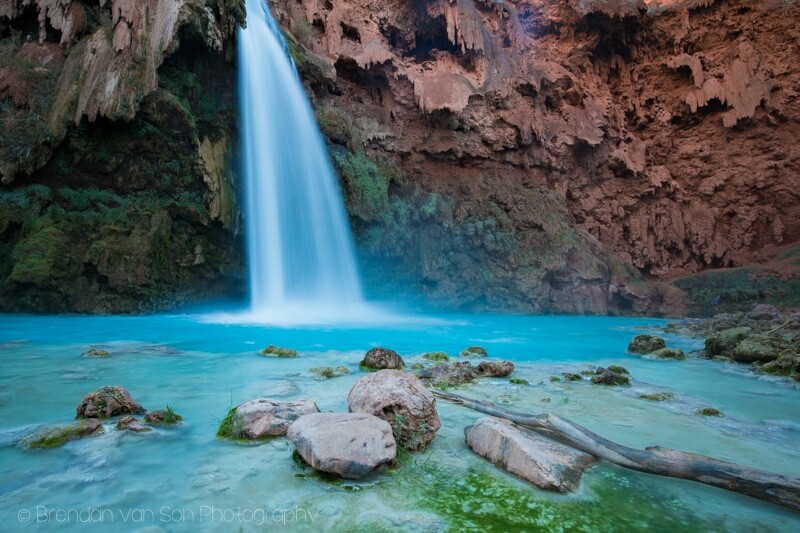 In Northern Arizona, Havasu Canyon is found on the Havasupai Reservation west of Flagstaff and north of Route 66. The canyon is an off-shoot of the Grand Canyon and belongs to the Colorado River System. 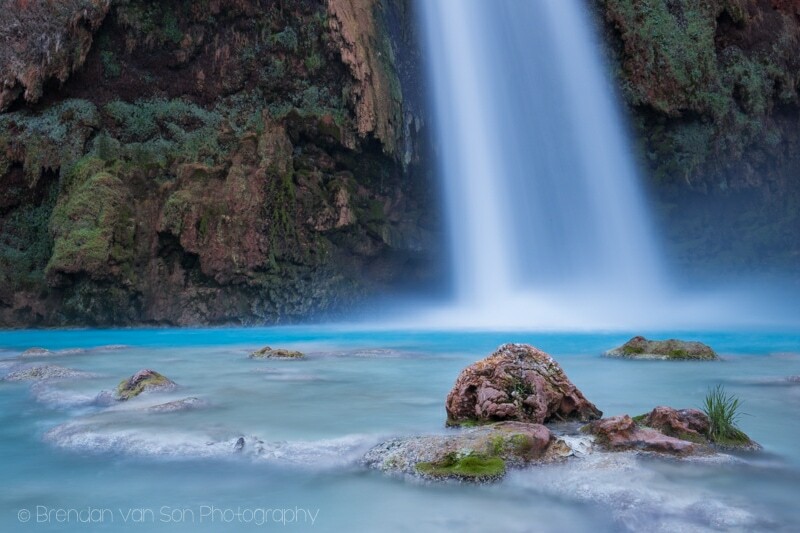 What makes Havasu Canyon itself so special is the water. The water found flowing through the river and over the falls here is so bright that I often get asked if I’m saturating my images in post-processing. The reality, however, is that the water in Havasu Canyon is that colour as a result of the spring water being so densely engulfed in minerals that it causes light refraction and reflection much like the way it happens with the “rock flour” in the lakes of the Canadian Rockies. Walking into Havasu Canyon is a bit like walking back in time. 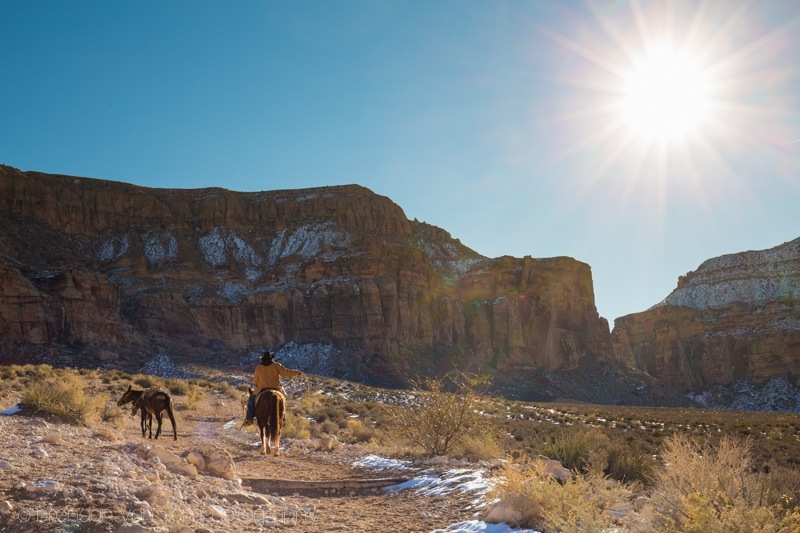 And arriving into the village of Supai means that you’ll be walking into the last town in America to receive its mail from US Post via mule train. 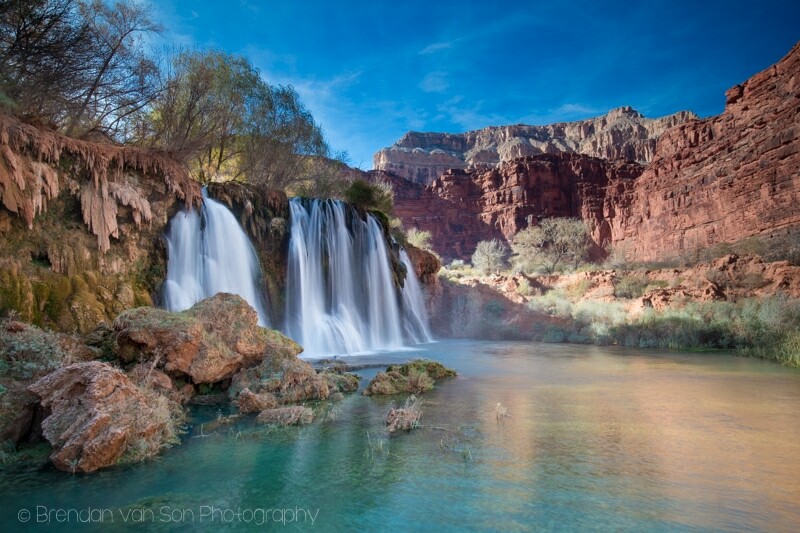 To get to Havasu Falls you have to hike, horse, or helicopter. If you’re hiking into Havasu Falls you’ll need to start by driving to Havasupai Hilltop which is found at the end of Indian Route 18 60 miles north of Route 66. Don’t believe your GPS if it tells you there is a more direct route from the south rim of the Grand Canyon. There isn’t. Once you arrive at the Hilltop it’s about 7-8 miles to the village of Supai. From there, it’s another 2 miles to the campground which is at the base of Havasu Falls and just before Mooney Falls. The walk from Supai to Havasu Falls is the most beautiful portion of the trek, but the first section from the hilltop to Supai isn’t without its charms either. Be prepared when hiking here as it can get hot, especially in the summer months. Moreover, there’s no water available on the trail, so pack more than you think you’ll need. 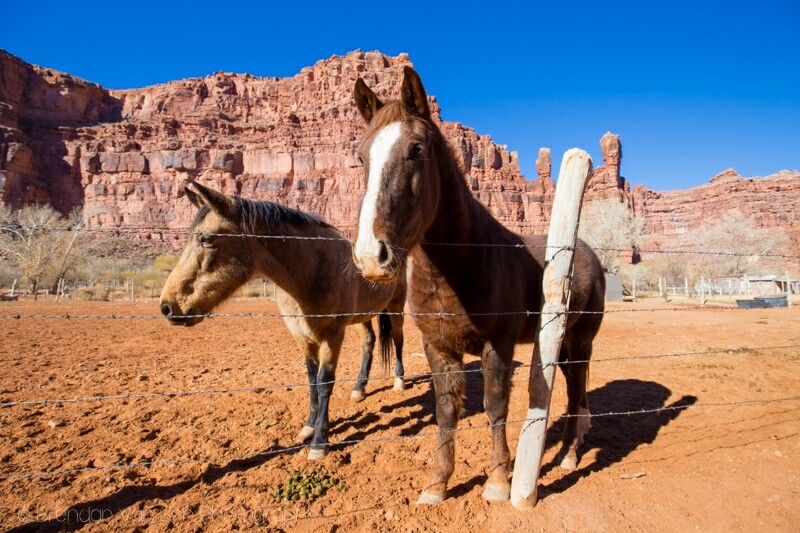 If you want to arrive by Horseback, you’ll have to arrange a pick up with the tourism office in Supai. When I last checked, a horseride into the canyon and back was about $150 round trip. 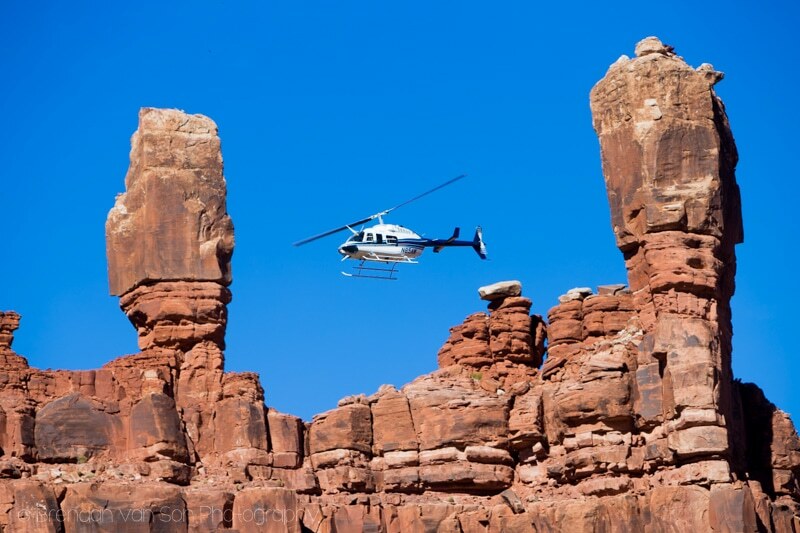 On the other hand, it’s also possible to catch a helicopter into the town of Supai. The cost of that is said to be around $100 each way. Again, call the tourism office in Supai to arrange that. If you’re planning on staying in Havasu Canyon – and you really should spend at least a night – there are only two options. The first option is camping. The campsite is just past Havasu Falls and is massive. They say they have enough room for 300 tents, and well I think that might be a bit of stretch, I wouldn’t be surprised to see it either. 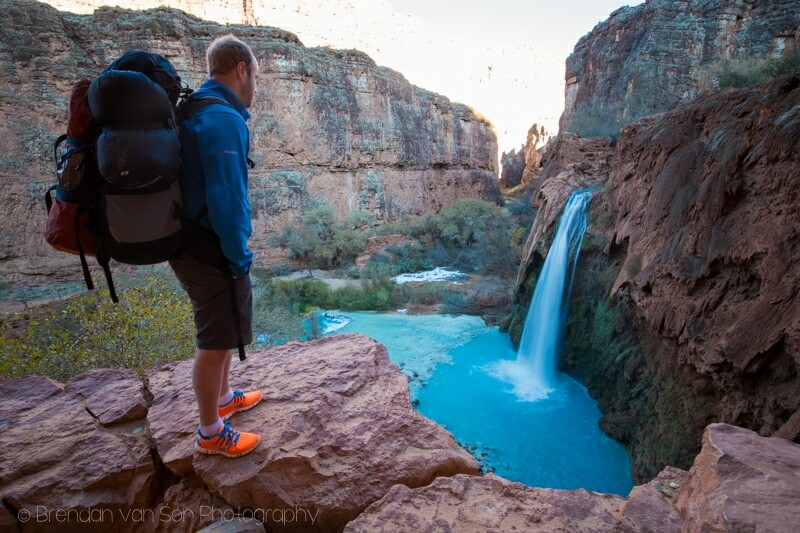 Both times I have been to Havasu Falls have been in January and each time I have been alone in the campsite. In the summer months, though, I’m told the campground is packed. 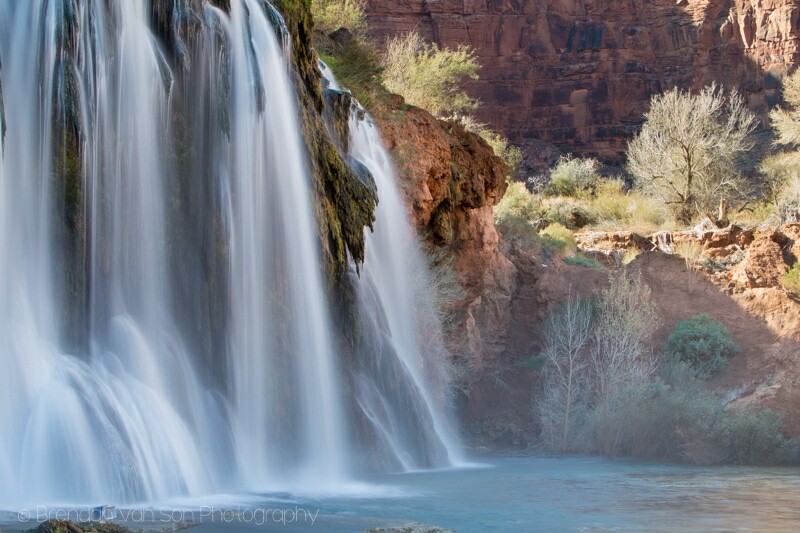 In the campground at Havasu Falls there is a spring of drinking water as well as toilets. There is no camping allowed. 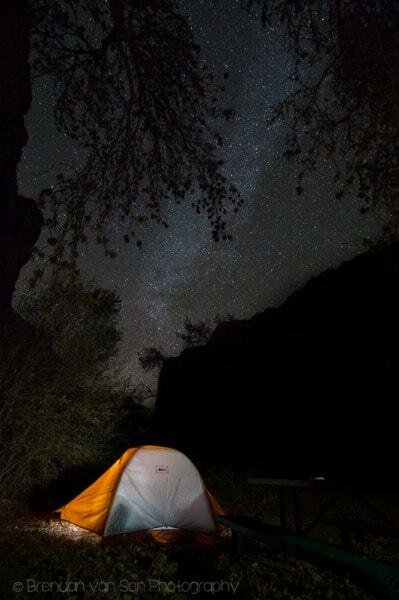 The cost of camping is $17.50 per person and that doubles if you fail to call in advance and make a reservation. The other option is to stay at the lodge in the town of Supai itself. Staying here would obviously be much more comfortable but also way more costly at $145 per night. The lodge is far from fancy, but is a roof over your head that you wouldn’t need to pack on your back into the canyon. I’m told that 4 people can share a room at that price which might work out as a good deal if you’re 2 couples. Like camping, you pay the fees at the park office. There is a park fee of $35 per person to visit Havasu which is paid at the park office in Supai. I’m only going to cover non-photography equipment because you know what gear you need to pack. I’m also going to assume that you’re camping. Camping Gear: You’ll likely want a lightweight tent, sleeping mat, and a sleeping bag built for cold nights. Food: You can get food at the cafe in Supai, but if you want to eat at the campsite you’ll need to also bring a stove as there are no campfires allowed. Water: Bring enough water for the hike. You can fill up at the campsite or buy water at the convenient store in town. But you don’t want to get stuck on the hike without water. Clothing: Layering is the key. Bring clothes that work when it’s warm during the day and when it’s cold at night. Misc: Don’t forget a flashlight or head torch. Also, bring in some toilet paper with you. 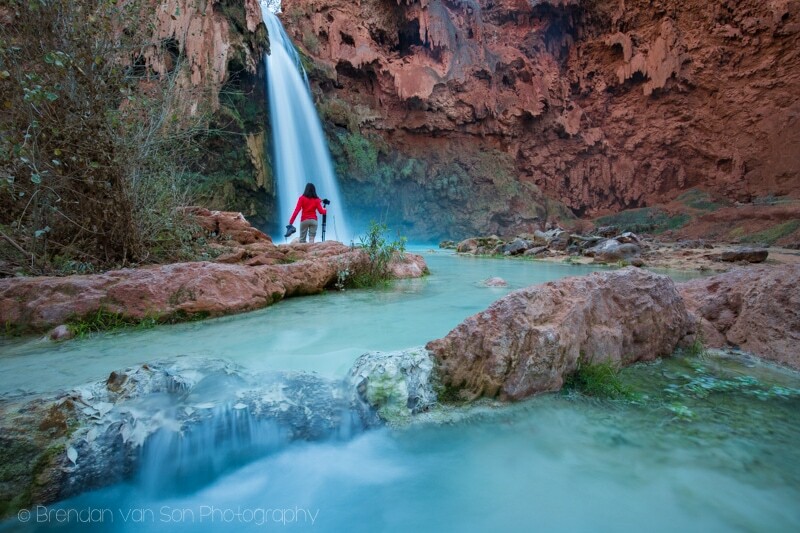 There is more to see in Havasu Canyon than just Havasu Falls. In fact, I think that some of the other falls are even more impressive than Havasu itself. This is a short list of things to see. 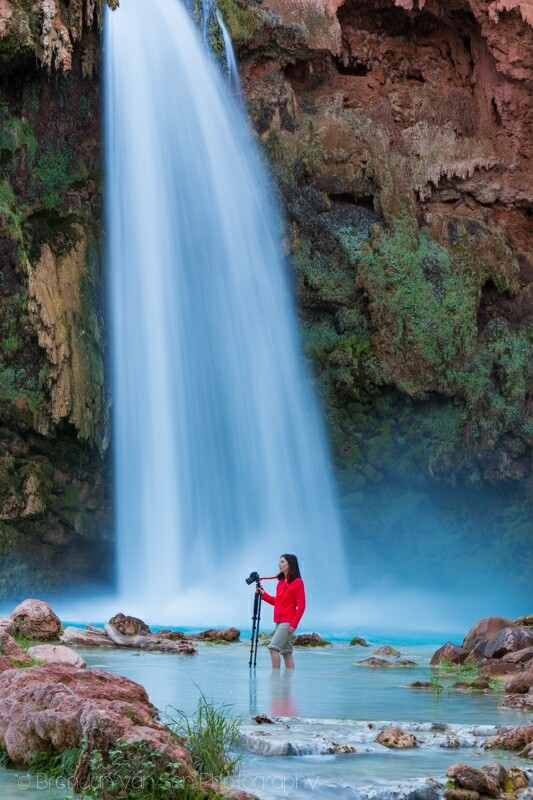 Havasu Falls: Let’s get this one out of the way. Mooney Falls: Twice the height of Havasu Falls and, in my opinion, even more impressive. Mule Trains: On the hike in, there are loads of mule trains moving stock. The Slot Canyon: It’s not incredibly narrow, but on the hike in there are a couple beautiful slot canyons. Najavo Falls: A different looking fall to the others. This one is the closest to Supai. 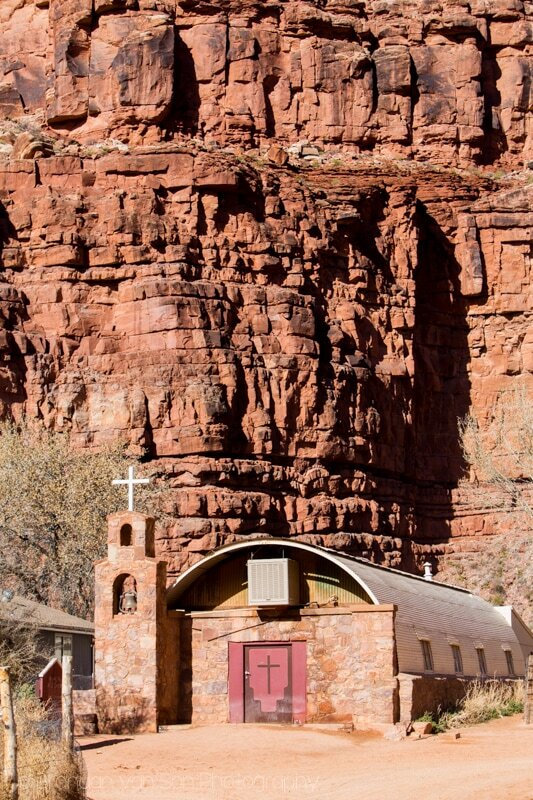 Supai: Town itself might not be pretty, but it’s worthy of a little exploration. 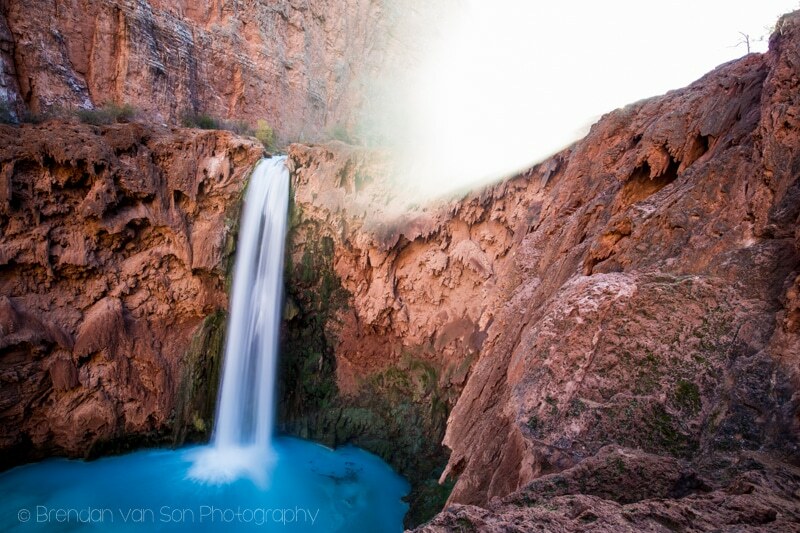 The last time I was in Havasu Canyon I got some cool images. But this time, I definitely did even better. I only had 2 days in the canyon which wasn’t nearly enough time. I would have preferred to have 3 days, and I feel like I missed some locations because of it. Still, considering that I was really only shooting limited amounts of time in the canyon, I got some rock-solid images. Check them out. The church in the town of Supai. This is Navajo Falls, the first waterfall you see on the way down the canyon. A zoomed image of Navajo Falls. It’s hard to get the scale of Havasu Falls. Thankfully, I had a model there for scale! I tried finding new lines and angles of the falls this time. Last time, my images were a bit limited, I think. Definitely got some cool stuff this time. 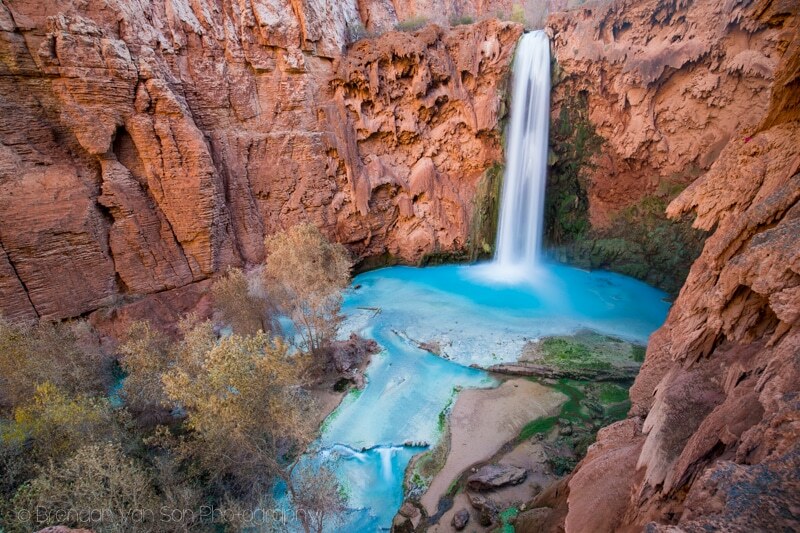 People keep asking if the colours from Havasu Falls are actually this blue or if it’s photoshopped. Yeah, it’s real. I mean it’s unreal to see, but the colour is as real as a heart attack. 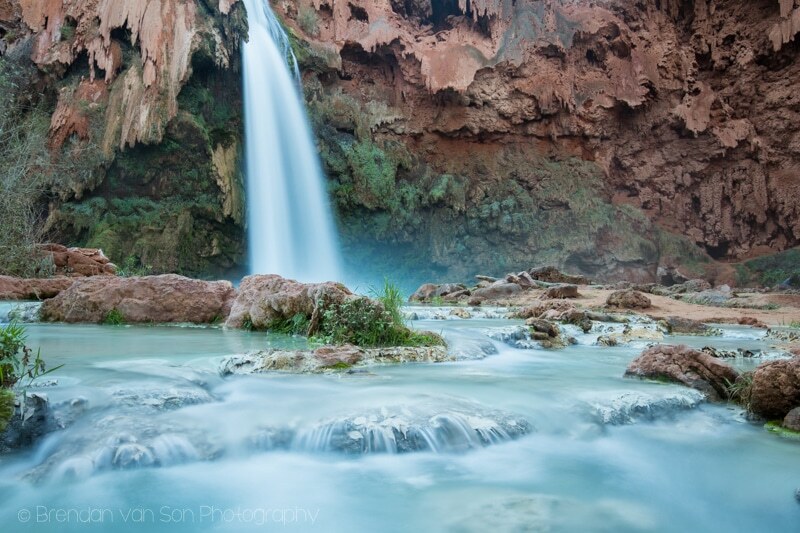 Mooney Falls is actually my favourite of the falls in the Havasu Canyon. 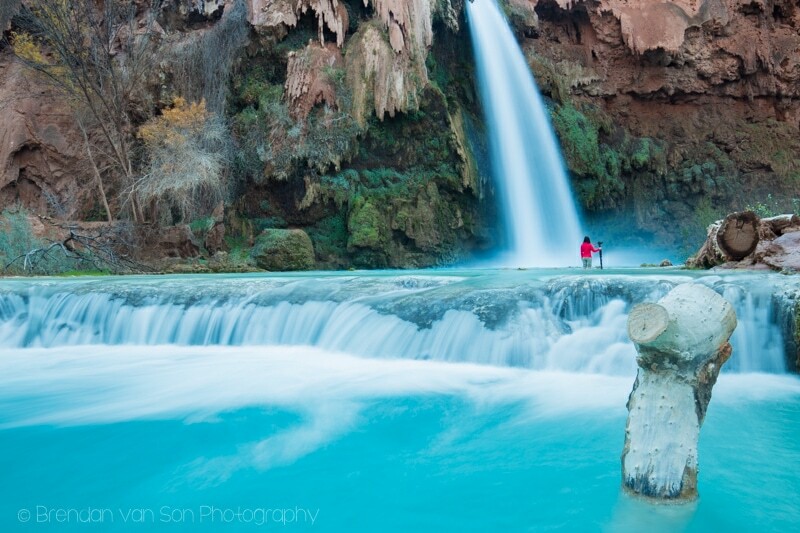 It’s twice the height of Havasu Falls and at least three times more awesome. Another image of Mooney Falls. Wish I had a helicopter to get out of here. The road trip continues as I am starting to make my way east. The first stop we’ll be making is White Sands National Monument and then we’re on to a place I haven’t been before called Guadalupe National Mountains Park. It’s gonna be fun! Stick around. Brendan, this was really helpful. I appreciate the time you take to post about your travels. I’m assuming that the only way back out of the canyon is the way you came in? Is it a steep ascent? I’m also wondering if a chopper can pick you up at the bottom of the canyon. I want to do the walk down but am not sure about the hike back up. 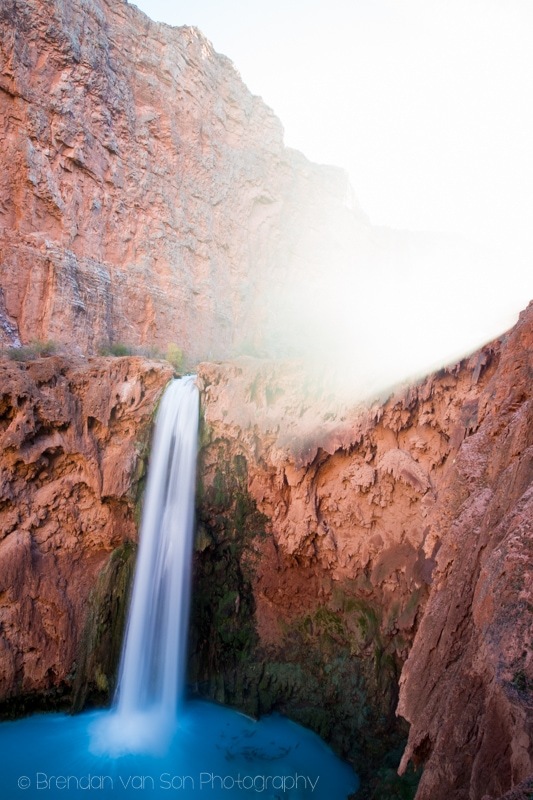 Is the lodge in Supai close to the falls? I’m trying to get a feel for the layout so I know what to expect. Again, great work, great images, can thanks for the article! The ascent is fairly flat until the last 2 miles which are pretty grueling. Yes, you can arrange to have a chopper pick you up from Supai. I think the q-way cost is about $100. The lodge is about 2 miles from the falls. The walk between the two is beautiful as there are lots of other waterfalls to see as well. Brendan, is the park entrance fee paid at the Hualapai Hilltop? Right now they’re saying the park isn’t open until May.. When you say the last two miles is grueling, would that be an uphill or downhill kind of grueling? I’m a bit intimidated by all the weight I’m going to have to tout on my back. I appreciate your comments. I’m not a camper, although I am a hiker, but I’ve not taken on an adventure quite this intimidating because I know I’m going to have to pack food and supplies. OMG nevermind Brendan! The park is open.. that was dated May 2011. Oh man, the National Parks websites in the states are so dated. haha. You pay the entrace fee once you get to the town of Supai. There’s an office on the left side of the street in the heart of town. It’s right near the grocery store and cafe. The last two miles back out are grueling up. You’re essentially hiking right out of the canyon. I pack A LOT of gear. Of course, I had all my photography equipment with me. But, if you go slow and steady, it’s not so bad. Also, you might not have to pack as much food as you think as you can re-supply in Supai. There’s also a cafe there where you can have breakfast, lunch or dinner. Just note that Supai is about 1.5 miles from the campsite. Also, in the campsite there is drinking water available at the spring. Anyways, enjoy! And if you have more questions, let me know.